I have a few fantasies that I'd like to have come true in the consumer products industry. 1) Less money spent on advertising and promoting of products. 2) Less money spent on expensive, often wasteful, packaging. 3) Less money spent paying slotting fees to obtain prime shelf space in major grocery chains. Like I said, these are fantasies. But are they really that unrealistic? For some reason, everybody in the food and consumer products industry thinks expensive, heavy and repeated advertising is a critical ingredient for success. Maybe I'm just a dummy, but doesn't everyone already know all the major consumer brands out there? Likewise, slotting fees are seen as a standard business cost. Why? Because those companies that lock up the best shelf space in your grocery store believe it helps drive sales. Never mind that the days of the standard grocery store dominating the consumer landscape are nearly over. 1) Energy efficiency. If evil Wal-Mart can go green in a major and revolutionary way, why can't the companies that make and sell the things on WMT's shelves do the same? 2) Lower prices. It's hard to know the numbers with precision, but my best guesstimate of the combined costs of heavy advertising, wasteful packaging and slotting fees could be as much as 25-30% of the retail price of the consumer products we buy. Energy costs could be another 5-10%. What if consumer products companies dramatically reduced these costs, gave half of the savings to consumers in the form of price cuts, and kept the rest as higher profits for shareholders? Sure, it would be a radically different way to practice business, but everybody would come out ahead. 3) Finding growth outside the standard, predictable places. In developed markets like North America and Western Europe, even the best consumer products companies really have to struggle to achieve 3-4% annual sales growth, a truly measly growth rate. And, as we mentioned above, everybody here already knows all the major brands, which limits the incremental gains from all that money spent on advertising and brand building. But in emerging markets all over the world there are double- and triple-digit growth opportunities, and in many of these countries the key global consumer products brands are not that well known. Yet. Some of the numbers are quite frankly shocking: For example, it takes less than two years for India to increase its population by the total population of Canada. Here's another one: the Indian middle class, at some 350-400 million people, is larger than the entire US population--and growing significantly faster in both spending and size. Countries like India, as well as many other emerging markets nations like Vietnam, Indonesia, Malaysia, South Africa, Brazil and some two dozen others now have the wealth to buy tens of billions of dollars' worth of aspirational products that we here in developed countries take for granted. Best of all (and this will likely surprise most readers), the profitability of a sale in places like India is often higher than in the USA, in part because emerging markets have natural demand growth that doesn't need to be artificially juiced with costly advertising. Look, long time Casual Kitchen readers know that food companies aren't evil. Investors want reasonable profits. Consumers want the products they want at a reasonable price. These are basic economic realities. But just think how much better off everyone would be if consumer products companies took these extra steps and embraced all of my fantasies. Well, okay. Maybe they shouldn't embrace all of my fantasies. This is the ninth article in my multi-part series on Understanding the Consumer Products Industry. I wonder though- what would their incentive be? Clearly they think the slotting fees and advertising help. They probably have studies that show it. 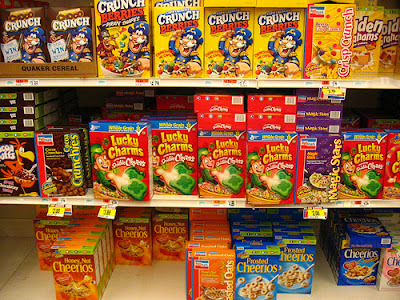 Without the ads and the bright colors, their food is just the same as the generic brand. And someone can undercut them! And it becomes easier to get into the market. For one, I'm not sure you can generalize about the quality of the products made by the consumer products industry. With Capn Crunch cereal--well, okay, stipulated. I've hammered many times here on branded boxed cereal. But what I am trying to do here is bring this conversation to a broader level--beyond just easy-to-hate-on processed cereal. The consumer products industry makes an incredible range of high quality products: soaps, detergents, shampoos, pain relievers, etc, etc, that are in many cases higher in quality that what's available in many emerging markets. And, as as result, they are in demand in there. Marcia, good point, and perhaps these are just what they are: fantasies. But I'll ask again: is there really a major brand out there that you don't already know? And in a typical grocery store with 50,000 items and 15 aisles of products, are you going to be thwarted from buying your favorite brand of shampoo just because it's on the "less-desirable" bottom shelf instead of the eye-level shelf? Isn't bottom shelf placement more about how much you actually see? I mean, I'm not sure there's a real difference in the products themselves. And when people are given too much choice, they tend to be almost paralyzed by it. So what do I think of your fantasies? Hard to say. I know it may sound counterintuitive to American culture, but perhaps less choice for all involved for products that we use in our lives would actually be a relief. Yes, Leigh, I'd agree. But again, don't we all already know where our products sit on the shelves? If one of the products you regularly buy all of sudden moved to the bottom shelf, would you automatically buy something different? I wouldn't. The question of choice is a great one, in fact in my post How to be a Satisficer I talked about a great book by Barry Schwartz called The Paradox of Choice that helps sort out the issue you raise. Thanks for your thoughts.